Use our guide to assist you in selecting a beer to fit your palate. If you think that you don't like beer, then you have never really tasted quality beer. Not all beer is alike. Many of the well known beers that you hear about everyday are not what we consider great, high quality beer. Many highly advertised beers are watered down and lack the old world ingredients that have been around for hundreds of years. 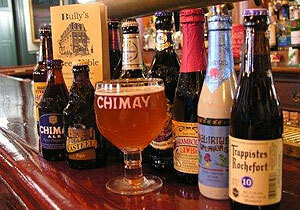 For instance, if you're a Bordeaux, Port, or Scotch drinker we probably have a beer that you will enjoy. And, if you already love great beer, than you're a little closer to beer heaven. Here at Bully's we pride ourselves on not only pouring a great looking draft beer, but on offering a selection aimed to please. You will find that we always maintain a few of the perennial favorites, while we change our other taps frequently in order to offer exciting alternatives to the ordinary macro brewery fare. The style, origin, taste, mouth feel, and alcohol by volume (ABV) are just a few of the differences you will discover as you try our exciting and ever changing array of draft beers. And remember, we have the beer sampler, where you choose any 4 to try, allowing you to discover innovative styles and possibly your new favorite beer! Lancaster Counties Home for every Dogfish Head Brewery release! An interesting fact about beer brewers is that they become jaded with their same old flagship beers they put forth each season. Eventually, on either a whim or a seasonal cue, they shake up their routine by creating new beers that are revolutionary, one-of-a-kind, or designed to enhance the spirit of a particular season. At Bully's we provide our customers with an ever-changing assortment of these inspired beers which are listed, and described in, our Beer Bible. We work at keeping this collection of micro and specialty brews, which originate from all around the United States and abroad, fresh and updated to please beer lovers of all ilks. Wine is an extremely popular beverage in the United States with a history dating back to ancient Greece. With such an extensive selection of wines available worldwide, we at Bully's endeavor to offer the varietals which are most preferred by our customers. Along with our boutique selection of familiar favorites, we offer some exciting new wines, popular sparkling wines, and delectable dessert wines, all of which are certain to please wine connoisseurs of every type. What is a Martini? 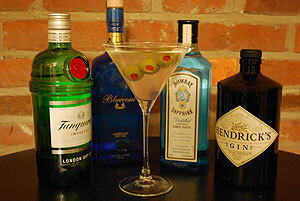 The Oxford dictionary defines a martini as a cocktail made from gin and dry vermouth. 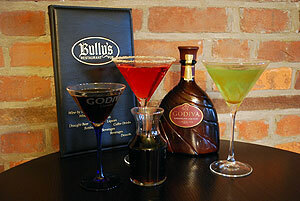 At Bully's however, our martinis are so much more. We offer this best known of mixed alcoholic beverages as any number of incarnations including fruit, chocolate, vanilla, vodka, tequila, and multiple liqueur martinis. Seeing as there are far too many of these fantastic cocktails to list them all, culled from creative minds the world over, we encourage you to request your current obsession from our bartenders, and please do not be shy! Bully's offers an exciting variety of specialty and seasonal drinks utilizing the most tantalizing of liqueurs and mixers available. We serve up the most inventive new combinations as well as your traditional favorite concoctions. And, due to the excess of cocktails available, hailing from every corner of the universe, we challenge you to challenge our staff to create the specialty mixture of your greatest imaginings! Whiskey, which is Gaelic (old language of Scotland & Ireland) for the water of life, originated in Scotland and Ireland in the 15th century, and became a legalized industry in the 19th century. Whiskey began to gain popularity in the United States in the 19th century due, in part, to trouble with wine production in France. Then came the American prohibition of the 1920's when U.S. distilleries were licensed to produce whiskey for medicinal purposes. What with everybody producing, and smuggling, all manner of whiskey, this had the effect of practically guaranteeing its continuing popularity in the States. 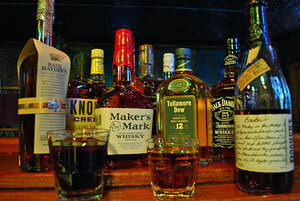 At Bully's, we have a fine selection of whiskeys from all the best and most popular distilleries. And, if you are uncertain of what type you may prefer, or even if you are new to whiskey tasting, we have the solution; whiskey flights! You may sample any 3 of your choice, and begin your true appreciation of fine whiskey. 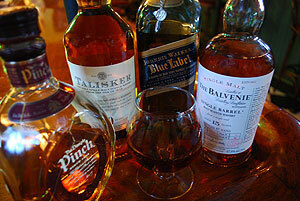 Did you know that Scotch, as it is known in the United States, is actually Scotch whiskey? It, of course, originated in Scotland in the 15th century, when the fledgling, hobbyist, distillers were hiding out in the hills to avoid English taxation. Later, after distilling became legalized in the 19th century, and production of Scotch whiskey became professionalized, its reputation, and popularity, began to seep into the U.S. Scotch's status in the U.S. was initially increased by the destruction of wine production in France in 1880, and later by the prohibition of the 1920's. For Scotch whiskey to be a true Scotch, it must be aged for at least 3 years following distillation, usually in oak casks, with the finer brands being aged 15 years or more. 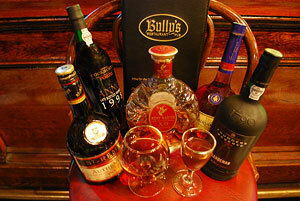 Bully's offers a first-rate assortment of single malt Scotch whiskeys, as well as many high status blends. And, for anyone from the Scotch enthusiast to the neophyte, we have single-malt Scotch flights where you choose any 3 for a truly delectable sampling! Cognac is the specific and well-known type of Brandy from the Cognac region of France, and is aged a minimum of 3 years, and often much longer. Courvoisier and Remy Martin are among the most admired varieties of this smooth sipping, after-dinner liqueur. Brandy, the product of highly distilled grapes or a few specific fermented fruits, is a shortened version of the Dutch word brandewijn meaning fire wine, and is grown throughout the world. Aficionados often sip it by holding it cupped in the hand to subtly warm and bring out the delicate flavors. Port, a strong, usually red wine, is fortified with grape brandy to halt the fermentation, which causes it to have a higher alcohol content than wine. The traditional varieties from Portugal are called Porto, and are aged first in wooden casks, then for years in the bottle. Sherry, arguably the oldest of this class of liqueurs, is a brandy fortified white wine which is aged at least 3 years in American oak casks to obtain its rich smoothness. Sherry is regarded by some wine writers as a ?neglected wine treasure. Bully's encourages you to treat yourself to our variety of appealing cordials, either before or after dinner, and gain a new appreciation of these wine based stunners! Gin, most likely from derived the Dutch word genever, meaning juniper, first achieved popularity in Holland in the 17th century, where it was sold as a tonic to treat gallstones, rheumatism, and stomach aches. Most gin is distilled in efficient column stills using primarily a mixture of malted barley, wheat, corn, & rye, resulting in a high-proof, light-bodied, and clean spirit. Flavoring is achieved by either distilling yet again, in a unique manner, or by mixing the botanicals into the base spirit. The chief flavoring agent is the highly aromatic blue-green berry of the Juniper, added in earlier times for its healing properties. Gin is also flavored by a number of other botanicals including anise, angelica root, cinnamon, orange peel, coriander, and cassia bark. However, the exact combination of botanicals, or the number used (from 4 to 15) remains a secret of each brand. In the early 18th century, gin's popularity spread to England, where the distilling process as well as the flavor was simplified by discarding the step of ageing it in wooden casks. When it was ruled that gin could be produced without a license, it became more prevalent than beer production, and nearly half of the London bars began specializing in gin. The most prevalent modern style, London dry gin, was perfected in the 19th century and remains as the simple but favorite crisp style for use in traditional martinis and other mixed drinks. Rums were made in the Caribbean during the early 17th century by fermenting the molasses left over from refining sugar into a heady liquor. Rum is one of the most ill-defined of the world's major liquors, with standards differing drastically from nation to nation. Light rums are low on flavor and primarily used in mixed drinks, gold rums are slightly higher-quality and aged somewhat, and dark rums are aged even longer and have a very rich and full flavor. 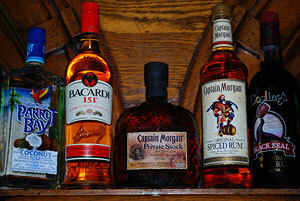 Many rums are also flavored with spices, coconut, and various fruits. Commonly enjoyed in a mixed drink, most rum connoisseurs hold that rum should be aged and drunk alone or on the rocks. 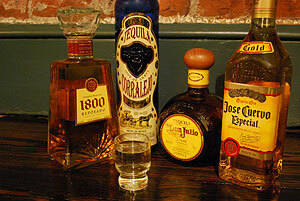 Tequila is made from the distilled agave plant, and is a specific and regulated form of mescal, thename given to alcoholic drinks derived from agave. Blue agave or agave tequilana? is the species of this succulent from which tequila is made, and the best brands use 100% agave. Bulk such as sugar or corn is often used to supplement the expensive agave, but at least 51% must be agave in order to be certified as tequila. While archaeologists think humans cultivated the agave plant nearly 9000 years ago, evidence shows that the Spanish Conquistadors first distilled the drink about 500 years ago. Using techniques nearly identical to those perfected in 19th century Mexico, todays tequilas are classified as Blanco (white, silver) that can be stored up to 2 months before bottling, Reposado (rested) is aged 2 months to 1 year in large vats or oak barrels, and Anejo (attached, dependent) is aged from 1 to 7 years in barrels of 350 liters or smaller. In recent years the increased popularity of tequila worldwide, has resulted in a wider range of top shelf brands becoming available. Vodka, roughly translating to little water in Russian, is thought to have originated in Poland or Russia between the 14th and 16th centuries. Although this distilled spirit can be made with anything from beets to potatoes to corn, it is generally produced from wheat or rye, which is then heavily filtered. By law, vodka produced for consumption in the United States or Western Europe traditionally could not have distinctive colors, smells, or flavors. In recent times, however, many flavored varieties have become available including pepper, fruit flavors, herbs & spices, cinnamon, vanilla vodkas and more. Although drunk straight in many countries where vodka has a long history, such as Eastern Europe, vodka's popularity in the U.S. derives primarily from the fact that its high alcohol content, combined with little to no taste, makes it ideal to use as a base for creating mixed drinks. Bully's coffee drinks are made with Lancaster County's own premier coffee, Gerhart Coffee, who have been roasting their own premium blends since 1880. To create our delicious coffee drinks we first start with the best coffee; you choose regular, decaffeinated, or a mixture of the two; and then proceed to make it even better with the addition of flavorful liqueur, and then top if off with real whipped cream. 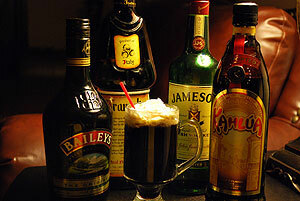 Bully's offers a list of popular favorites ranging from traditional Irish coffee to the newer Roman Rasta coffee. In addition, we'll be happy to whip up the coffee drink of your choice even if it isn't listed, so don't be shy, just ask our staff! You may feel free to enjoy our coffee drinks either before, during, or after dinner, because these heart warming concoctions taste fantastic any time! Come and have a great time at Bully's beautiful antique bar with its comfortable padded bar stools and high top tables. It is the perfect place to unwind as you choose from our generous selection of drink options. We proudly boast one of largest selections of imported, craft, and domestic beer (bottled and draft) in Lancaster County! Moreover, we offer a fine choice of wines, and a constantly changing selection of crowd-pleasing seasonal specialty drinks. So, hang out with your friends and enjoy your preference from our extensive assortment of cocktails! ©2017 Bully's Restaurant. All Rights Reserved.